I wrote about a class outing to Leicester Square in London and spotting Mr. Warwick Davis. Ordinarily if I spot celebs doing their thang I will just leave them be. However, on this occasion Mr. Davis looked like he was just heading from A to B and happy to share a few seconds with people. I asked if I could take a quick portrait and the intention was to ask if I could add him to my 100 strangers project on Flickr. He was happy to stop and pose briefly but I didn’t get the chance to ask about my Flickr project because others started asking for selfies with him. I’m fairly certain he would have no concerns about sharing the image on Flickr but the group rules are very clear, permission must be granted to post on their page. So for the time being my Warwick Davis portrait will not appear as one of my 100 strangers. I actually wasn’t going to post the image here either but two people have asked to see it. The story behind this image was a college trip to Leicester Square. 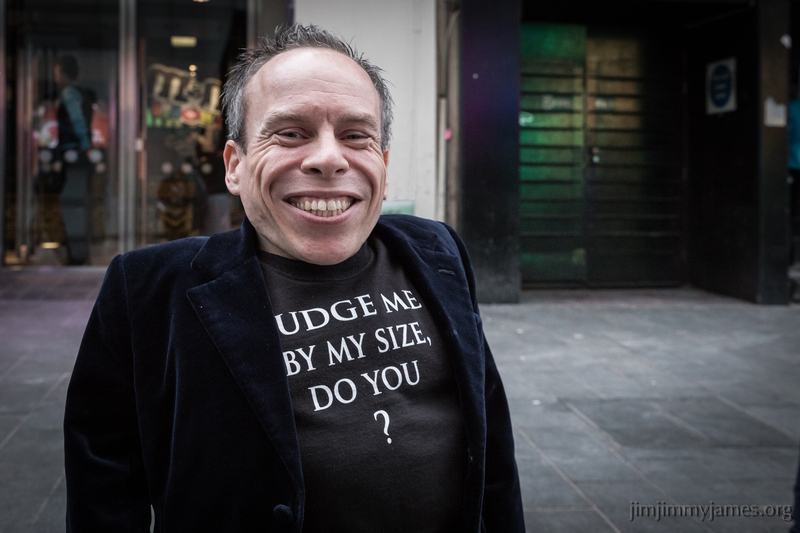 I was struggling a little until I spied Warwick Davis and had taken his portrait. He seemed a bit taken aback when I asked to take his portrait but he is probably used to just being papped. Regular readers will know that is not how I do things. Although I say he did not seem in a great hurry, he clearly was heading somewhere and I knew I would only have a few seconds with him. I decided there was not going to be time to fart-arse around changing my lens. The class project also had to be shot in landscape view so my head was not thinking in terms of portraits and bumping into Mr. Davis was totally unexpected. As a quick shot I’m actually reasonably pleased with this portrait. Had I felt I had a couple of minutes I would have considered the background a little more. (As it is I photoshopped out a sign that was at the side of his head). I would have considered using a slightly shallower depth of field and I should have used the camera in portrait view. I also could have changed the focal length of 35mm by zooming to 70mm. My personal criticism is that I didn’t notice and take a second to ask him to move his jacket a smidgen so that I could get the full slogan on his shirt. That said, I certainly wouldn’t consider the portrait a failure. As always the unexpected opportunity presented itself and has been a valuable lesson in my development. I’d like to thank Mr. Davis for his time and thank you for reading my blog.